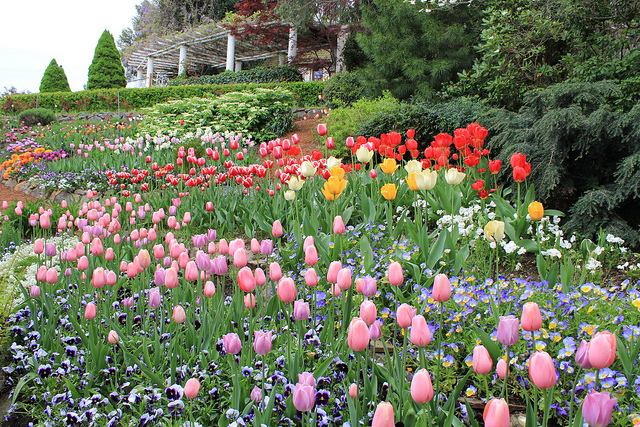 Starting in early-mid April and continuing into early May, enjoy the glorious color and serenity of 17,000 tulips in bloom during Springtime at Ananda 2019, at Crystal Hermitage Gardens in Nevada City. The gardens are open daily from 10am to 5pm (1pm – 5pm on April 22nd) and attract over 10,000 visitors per year, including families enjoying free admission for children 12 and under. Admission is $8 on weekdays, and $10 on weekends – including “Scone Weekends” on April 13th-14th and 20th-21st, Easter weekend. Visitors are welcome to explore the upper terraced gardens and follow the meandering paths by pools, waterfalls, and statuary, and to visit the gift boutique, shrine, award-winning chapel inspired by the Little Church of St. Francis in Assisi. Inside the Crystal Hermitage house, visitors will discover a spectacular collection of Kashmiri wood carved furniture by India’s Suffering Moses, ethereal paintings by Italy’s Guido Odierna, and Balinese art carvings depicting the Ramayana, India’s epic written thousands of years ago. “I joined a group for the drive to the garden, and although I have visited many gardens around the world, I’ve never seen anything remotely like it,” wrote one garden blogger. A vegetarian lunch or overnight accommodations can be reserved at The Expanding Light Retreat by calling (530) 478-7516 extension 1. At the Master’s Market in the heart of ”downtown Ananda” visitors will find a selection of vegetarian grocery, bakery, and deli items, with cafe seating indoors, and outdoor seating on the green in the uplifting surroundings of Ananda Village. Situated along the San Juan Ridge on a precipice overlooking the Yuba River Canyon and Tahoe National Forest, the gardens are a scenic, 25-minute drive from Historic Nevada City. 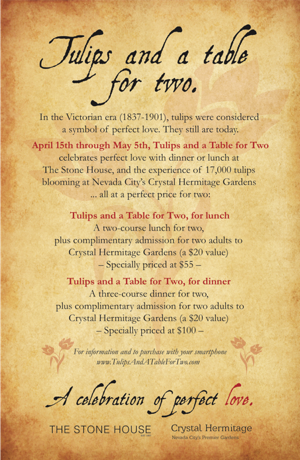 For more information, tulip bloom updates, photography guidelines, and directions, please call (530) 478-7574 or visit crystalhermitage.org. You may also email hermitage@ananda.org. Bloom updates will be on Instragram and FaceBook Live. Tickets may be purchased online at crystalhermitage.org/tickets. Groups are welcome to visit weekdays, 10am – 5pm. For groups of 20 or more, please call in advance at (530) 478-7587. Unfortunately, disability access is limited at this time. Please no dogs, picnicking or alcohol at the gardens. For media inquiries, please contact Mai Lee at 310-621-3721, or at mai@ananda.org.